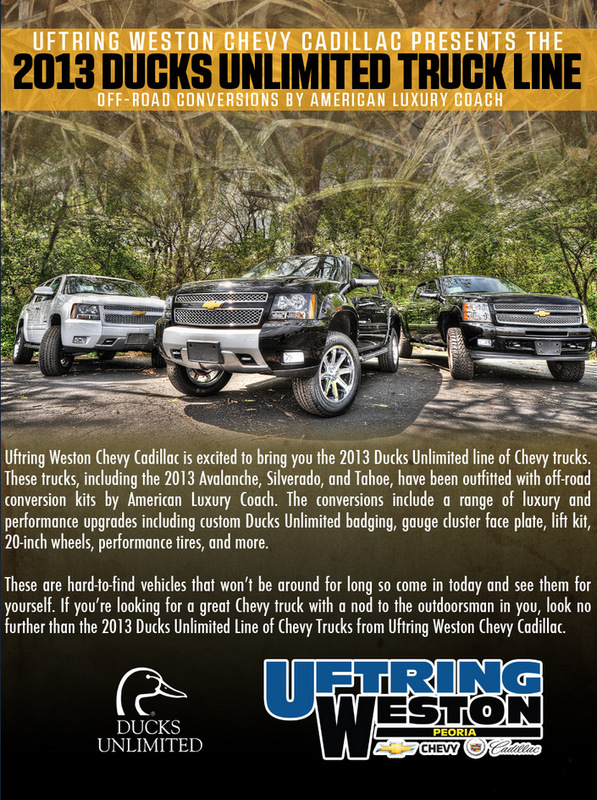 Uftring Weston Chevy Cadillac in Peoria, Illinois is proud to introduce our line of Ducks Unlimited Off-Road Conversions by American Luxury Coach. These new 2013 Chevrolet trucks are incredible, and feature the finest Ducks Unlimited packages in Central Illinois. These trucks, including the 2013 Chevrolet Avalanche, Silverado and Tahoe have been outfitted with off-road conversion kits by American Luxury Coach for the ultimate outdoors and performance experience. The conversions include a range of luxury and performance upgrades, including custom Ducks Unlimited badging, gauge cluster force plate, lift kit, 20-inch wheels, performance tires and more. These are limited-edition, hard to find vehicles that will not last long - so stop in to Uftring Weston Chevy Cadillac today - your Peoria Chevy Dealer - for a test drive. If you're looking for a performance-ready Chevy trucks with a nod to the outdoorsman in you, look no further than Uftring Weston - serving Peoria, Morton, Pekin and Chillicothe. See multiple pictures and more at UftringWeston.com.